[137 Pages Report] The infrastructure as a service (IaaS) market is expected to grow from USD 15.79 Billion in 2015 to USD 56.05 Billion by 2020, at a CAGR of 29.0%. The infrastructure as a service (IaaS) market is witnessing tremendous growth and presents many opportunities, making it a lucrative market. The increasing demand for organizations to reduce the IT burden and lower the costs incurred in deploying data centers and hiring skilled resources to manage the IT infrastructures are driving the adoption of IaaS. The major areas of opportunities for IaaS are the increasing demand from the increasing number of SMBs, the need to deploy enterprise level computing capabilities to compete in the market, and the increasing digitalization among the organizations and the economies. Government initiatives to encourage the adoption of the internet and other advanced technologies in their economies are supporting the growth in this market. The infrastructure as a service market has been segmented by solution; deployment type; end user and industry vertical. This study has been done on a global level covering five regions broadly, namely, North Americas, Europe, APAC, MEA, and Latin America. The overall market is expected to grow from USD 15.79 Billion in 2015 to USD 56.05 Billion by 2020, at a CAGR of 29.0%. The research methodology used to estimate and forecast the infrastructure as a service market begins with capturing data on key vendor revenues through secondary research. The vendor offerings are also taken into consideration to determine the market segmentation. The bottom-up procedure was employed to arrive at the overall market size of the global IaaS market from the revenue of the key players in the market. After arriving at the overall market size, the total market was split into several segments and sub-segments which are then verified through primary research by conducting extensive interviews with key people such as CEOs, VPs, Directors, and executives. This data triangulation and market breakdown procedures were employed to complete the overall market engineering process and arrive at the exact statistics for all segments and sub-segments. The security analytics ecosystem comprises of security analytics vendors such as AWS, Cisco Systems, IBM, Microsoft, Rackspace, Google, CSC, VMware, and Fujitsu. The infrastructure as a service (IaaS) market is expected to grow from USD 15.79 Billion in 2015 to USD 56.05 Billion by 2020, at a CAGR of 29.0%. Several factors such as faster implementation, scalability, flexibility, and agility provided by the service; increasing market competition; and increasing demand for reducing investment on IT infrastructures, hardware, and hiring skilled resources are expected to bolster the growth of this market. Additionally, the adoption of hybrid cloud among organizations is increasing, due to certain limitations of data security and expensive cost in public and private cloud models, respectively. The increase in adoption of hybrid model has played a significant role in enhancing the adoption of solutions in infrastructure as a service (IaaS) market. The other major factors responsible for the upsurge in the adoption of IaaS include—optimum utilization of computing resources cost effectively; efficient management and security of business data; increasing digitalization; technological advancements; and escalating demand of disaster recovery, storage, and virtualization among numerous industries ranging from IT & telecom, BFSI, healthcare, retail & e-commerce to government and other industries is driving the growth of the infrastructure as a service market tremendously. Higher adoption rate in SMBs and mobility and BYOD trends among organizations have emerged as new opportunities to drive this market in the future. These technologies are supported by IaaS solutions, allowing users to connect from any location and providing many benefits, such as increased productivity, reduced IT, and operational costs. Some of the leading solutions include managed hosting, STaaS, colocation, and DRaaS. The IT & telecom industry, along with BFSI and healthcare industries, account for the largest market share in the overall market. Increasing volume of business data in such verticals and concerns related to the security, confidentiality, and management of such a huge volume of critical individual information, financial, and other health related information are some of the major factors resulting in high spending by the verticals in the markets. Other high growth sectors include retail & e-commerce, government, and energy & utilities. Among regions, North America is projected to have the largest market share and is expected to dominate the infrastructure as a service market from 2015 to 2020. This is backed by the existence of major IaaS vendors in the regions of North America. APAC is expected to showcase the highest growth potential and is projected to grow at a CAGR of 35.8% in IaaS market simultaneously. Increasing digitalization trends, adoption of internet, increasing adoption of smart devices and increasing number of SMBs demanding enterprise level computing capabilities at low cost, are increasing in countries India, China, Brazil, UK, Australia, and others thereby giving rise to the adoption of IaaS in the region. However, privacy and data protection concerns, high initial investment costs, and other operational challenges are faced by most of the organizations and they struggle to make the optimum use of IaaS and other cloud technologies, which has been significantly hindering the growth of the market. Technological giants such as AWS, Google, IBM, Cisco Systems, CSC, VMware, Rackspace, and Fujitsu, along with some other innovators such as ProfitBrick, Savvis, Mindtree, and others, are providers of leading IaaS solutions. 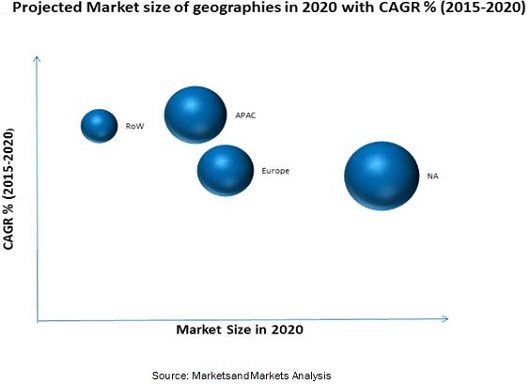 These players have adopted various growth strategies such as new product launches, partnerships, contracts, collaborations, acquisitions, and expansions to expand their global presence and increase their market shares in the global infrastructure as a service market.